Continuing with the Eighties nostalgia, one of the most recognisable artists from that decade would have to be Keith Haring, who made his name with graffiti style art around New York. 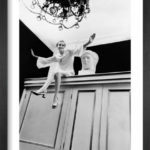 He believed in getting his work out to as wide an audience as possible so it has always been available on numerous products, such as cards and t-shirts. 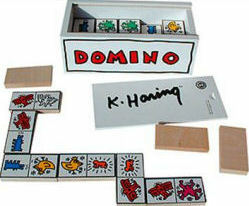 One of the more interesting items available is the Keith Haring Dominoes Set. Featuring his distinctive pop art animal characters, it makes a nice alternative to the standard spotted dominoes, and is especially suitable to teaching children the game. Halfpint Village Store have a set available to buy on their Ebay store, priced just under £23.